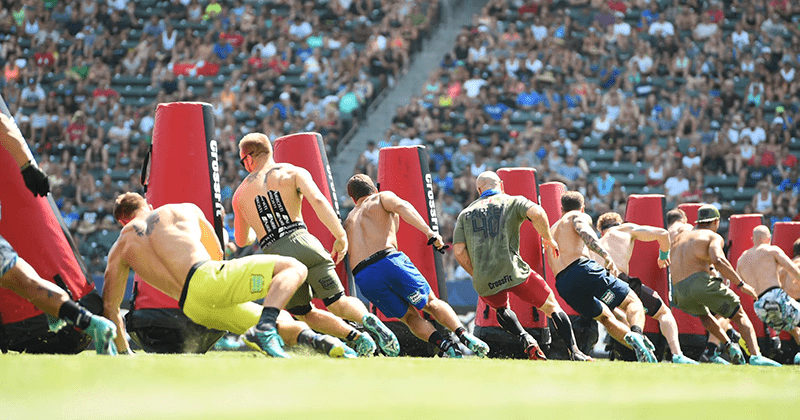 Over the years The CrossFit Games proved to be the ultimate test of fitness with athletes, at least most of the time, not really knowing what they’re getting into. The “cruelty” of the workouts does not always depend on Dave Castro, but more on the type and the abilities of an individual athlete. The “Powerhouses” don’t go well with endurance tests, while the “Engines” struggle with max lifts. However, no excuse is valid at the Games. The best of the best have everything and are willing to face the unknown. What all winners have in common is mental toughness. A random triathlon for the Games? No. A combination of big waves, soft sand, steep hills and Southern California climate? Yes. Pendelton was an event which consisted of two workouts: swim, bike, run as the first part, and obstacle course as the second one. Based on Jason Khalipa’s facial expression at the announcement, part one was also the hard one. The event took place at Marine Corps Base Camp Pendleton, Southern California in 2012. After 700 meters of ocean swim, athletes picked up their single-speed bikes and cycled for 8 kilometers. Soft sand, with tires getting stuck and athletes crashing down, was the tricky part. Pendelton 1 ended with a 11.3 run. Chad Mackay and Julie Foucher finished ahead, winning the first event of 2012 CrossFit Games. Think of Fran, and then triple it with chest-to-bars and muscle-ups. The workout was designed for teams (six athletes, three men and three women). The biggest edition to Frantasy land was the big bob, a 1000-pound heavy sled with a rig (where pull-ups, chest-to-bar and bar muscle-up were performed). The workout took place at the soccer stadium in 2014. Team CrossFit The Club won the event. Most athletes collapsed at the finish line after crossing a 100/60-yard long soccer filed twice. The event had two parts. Sprint sled 1 was won by Lauren Brooks, sprint 2 by Emily Abbott in women category. Neal Maddox won both sprints in men’s division.